Check out video of the event on UN Web TV! The Coalition, together with Parliamentarians for Global Action (PGA), are proud civil society co-sponsors, along with the Permanent Missions of Argentina, Austria, Belgium, Costa Rica, Cyprus, The Gambia, Republic of Korea, Liechtenstein, the Netherlands, Senegal, Slovakia, Slovenia, Switzerland, and Uruguay, of the event, 20th anniversary of the Rome Statute: the need for universality and the International Criminal Court’s jurisdiction over the crime of aggression. The interactive panel discussion, which will take place in Conference Room 2 of the United Nations Headquarters, offers a unique high-level platform for States Parties and other international partners to project publicly a strong and compelling narrative about the ICC’s mission in today’s world. The event’s panel will discuss the importance of the activation of the ICC’s jurisdiction over the crime of aggression as well as the need for universality of the Rome Statute. 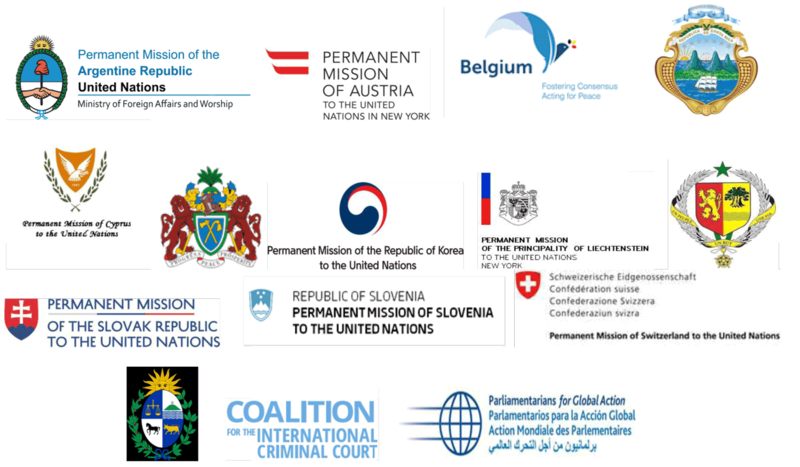 The event, which celebrates both IJ Day and the 20th anniversary of the Rome Statute, will take place in the margins of the High-Level Political Forum 2018, "United Nations central platform for follow-up and review of the 2030 Agenda for Sustainable Development and the Sustainable Development Goals," including Goal 16. Promote peaceful and inclusive societies for sustainable development, provide access to justice for all and build effective, accountable and inclusive institutions at all levels. Opening remarks will be given by H. E. Mr. Miroslav Lajčák, President of the United Nations General Assembly. The event, beginning at 10:00, will be moderated by H.E. Mr. Michal Mlynár, Vice-President of the Assembly of States Parties to the Rome Statute and chair of the New York Working Group. H.E. Ms. Aurelia Frick, Minister of Foreign Affairs of the Principality of Liechtenstein, H.E. Ms. Yoka Brandt, Vice-Minister of Foreign Affairs of the Kingdom of the Netherlands, Mr. James Stewart, Deputy Prosecutor of the International Criminal Court, H.E. Bruno Stagno Ugarte, Deputy Executive Director of Human Rights Watch, and Coalition Covenor Mr. Bill Pace will address attendees as members of the panel before opening the floor for interventions by Member States and civil society representatives. Mr. Benjamin Ferencz, Former Nuremberg War Crimes Prosecutor and long time member and supporter of the Coalition, will provide closing remarks. The event is open to all delegations as well as the public. Special event tickets will be provided to those without a valid UN ground pass. If you do not hold a valid UN ground pass and would like to request a special event ticket, please RSVP to: Ms. Irene Bruhin: (IB@nyc.llv.li).